The interview process can be an extremely nerve wracking process for most people. No matter how much you practice at home, when the final day of your interview arrives, you find yourself nervous, almost dreading the next few hours. Well, the good news is, you are definitely not alone in this battle. Most people face the ‘pre interview jitters’. Fortunately, even though it is not possible to completely eliminate the feeling of nervousness, it is still possible to go completely prepared for your interview. This can boost your confidence in several ways and help you make a good lasting impression on your hiring managers. When you go for an interview, an important thing to remember is that you are not the only potential candidate present there. The hiring managers will have to sit through several interviews throughout the day, so you want to make sure you are able to create an immediate connection with your interviewers. In order to do this, your first formal introduction must be capturing. Interviewers are used to the usual, clichéd answers at interviews, so make sure you don’t come off as the usual, run of the mill candidate. The following mentioned are few best way to introduce yourself in a job interview or how to introduce yourself in front of interviewer. During any interview process, the first 30 seconds are the most crucial. This is the moment you can either make it or break it. You will have an approximate of 30 seconds to charm your interviewers and get them interested in knowing more about you. It is what meets the eye that creates the first impression about a person. Even if you have a killer speech ready to sweep away your hiring managers, it is your presentation that they will notice first. In order to look presentable, you need to make sure you are well groomed. Your hair must be neat and clean, and pulled back from your face. Make sure you are wearing professional gear, and they are of subtle color and style. You can save the bright colors for the after party, when you go for an interview; you want to look fresh and neat. Your clothes must be washed and ironed; there must be no wrinkles or faded colors as this creates a very unprofessional image. It gives the impression that you are callous in your approach. Shoes must be polished and matching with the rest of your outfit, and remember to never, ever, skip the socks! You can always carry a blazer for a more professional look. It is the most common and understandable thing to be nervous for an interview. It is also natural for people to face more perspiration when they are nervous. Your palms might get sweaty and clammy; you might have sweat droplets trickling down your forehead, or even leave pit stains on your shirt. While it is considered normal, this is not a side of yourself you want to present during an interview. Just before you are called in for your interview, make sure you wipe your face off with a tissue. Always carry deodorant, as your sweat stench might shine more than your personality! For women, remember to touch up your makeup before you enter for your interview. Splotchy messy makeup is a strict no no for an interview. You must be neat and presentable. When you hear your name being called next for the interview, before entering into the interviewers’ chamber, take a deep breath. It is a natural response for you to feel nervous, your heartbeat to increase, palpitations begin, your mouth becomes dry. The only thing you can do in this situation is to take control of yourself and the situation. Take a long, deep breath. Calm your mind and ready yourself for the interview. Once you have prepared yourself for the next stage, walk up to the room in which the interview is being held. Knock on the door, and ask for permission to enter. Once you are given permission, enter the room and greet each and every person present in that room. Be smiling, polite, and keep a friendly tone of voice. Under no circumstances should you take a seat unless you have been asked by the interviewer to do so. This is a sign of respect, and will be appreciated by your interviewers. Greet them, and shake their hand firmly (this is optional). Once you have been asked to take a seat, sit down straight; keep a good posture and a smile on your face. Avoid as far as possible to fidget; do not tap your nails or fingers, shake your legs, play with your hair, crack your knuckles, etc. Even if there are multiple interviewers present who are taking your interview, maintain firm eye contact with the person who is asking you the question. When the person finishes and another interviewer is speaking to you, maintain eye contact with that person. Do not move your gaze from one person to another. 7. Brief Them About Yourself And Your Educational Background, Work Experience, etc. When you are being asked to introduce yourself at job interview, the first thing you must avoid doing is to start reciting your resume. Your interviewers have already looked through your resume, and after consideration of it, called you for an interview. They do not want to hear you talk about something they already know. Start off by wishing them, tell them your name, and brief them about your educational background. Do not take this opportunity to start naming each and every achievement or award you have won in school or college. If you must mention an achievement, make sure it pertains directly to your interview and the job you are applying for. For example, if you are applying for the job of a clerk in a bank, you do not need to mention your perfect attendance award in school or your first class rank in your history class. Only mention those things which you think will work in your favour for the job. It could be advantageous to mention that you have experience in accounting and are good at math, as these are both skills which are required for a banker. Unless specifically asked, do not mention your hobbies, or what you enjoy doing in your free time. You are applying for a job interview and your interviewers are not in the least interested what you do after your working hours. In case you have been asked to talk about your hobbies, mention those hobbies which you think might give you an edge for your job in that company. It might be good to mention any new languages you have recently learnt, as being bilingual can be an asset in almost any organization. By asking this question, your interviewers also want to know what you do with your free time, what your interests are, and how you are able to channel your excess energy. Saying that your hobbies are eating and sleeping might cost you a point in their books, as they would like to employ a dynamic person into their organization. It is also good to mention your previous work experiences, but beware; this might call for questions like why you left your previous job, and why you want to switch over to this company. You must answer these questions with extreme caution, as anything negative you say can be used against you and will cost you another point in the interviewer’s scoreboard. When you are talking about your previous workplace, be extremely diplomatic in answering any questions. The respect with which you treated your previous workplace will show your interviewers what to expect from you in the future. No matter how hard it was for you to work in your previous workplace; maybe your colleagues were terrible, your boss was not understanding, there were no benefits, do NOT mention these points in front of your interviewer. As far as possible, be diplomatic, mention proper reasons why you had to leave your previous workplace, for example, a good reason would be that you have stayed there and gained good experience and would now like to move on and grow elsewhere, or that after gaining enough experience in your previous work, you are now ready to take on the challenges of the new organization with promptness. Never talk down about your previous company, your boss or your colleagues. Sometimes, you will find interviewers asking you questions which you have no idea about. These are mostly trick questions, and they are asked to you to judge your wit, promptness, and how you deal with pressure. Under these circumstances, never answer the question unless you are sure of the answer. If you do not know the answer, simply apologize and tell them the truth. Honesty works much better in these situations than embarrassing lies. The interviewers are aware that you are not Google, and you do not have all the answers, neither are you expected to have all the answers. So do not get perturbed, remain calm and composed, and do not try to guess answers. Interviewers have been doing their job for a long time and are very aware of each candidate’s mannerisms and gestures. You do not want to give an impression of being restless, confused, arrogant or unapproachable. Maintain professionalism throughout your interview, even if you find the interviewers talking to you casually and making you feel comfortable. They do this just to make sure you are not overly nervous; do not take it as a sign to speak to them like you would speak to your friends. Interviewers are very observant. Any signs of fidgeting, bad body language or rudeness is observed and noted by them, even if they do not outwardly show it. So be extremely aware of yourself and your surroundings. Practice at home and with friends to ensure you are not slipping in your manners. Please, sorry, thank you should be words available at the tip of your tongue. Good manners go a long way. When you are at in interview, keep in mind that your hiring managers are taking time out of their schedule to hold an interview with you. There are dozens of other suitable candidates for the job, and if you make them feel like you have wasted their time, they would not take another second to consider you rejected. Keeping this in mind, answer questions asked to you in a brief, short, and crisp manner. Do not go into details about anything unless specifically asked. Time management and communication skills are two qualities required in every sector or every organization. Showcase these skills by your accurate answers. If they are interested to know more about a certain thing, they will ask you. Do not divulge any additional information on your own. It might be the case that you are sitting for several job interviews with different organizations. This does not mean in any way that you should allow yourself to go unprepared to an interview. Before you go for your interview with a specific company, research about the job profile you are applying for, what the requirements are, and about the company. You must know at least a brief history about the company, and what are the companies’ goals, and how they plan on reaching them. This will allow you to convince your hiring managers how you would be an asset to the company. A company will not want to hire you simply because you look good on paper; they also want to know, “Will you be of useful to the company”. 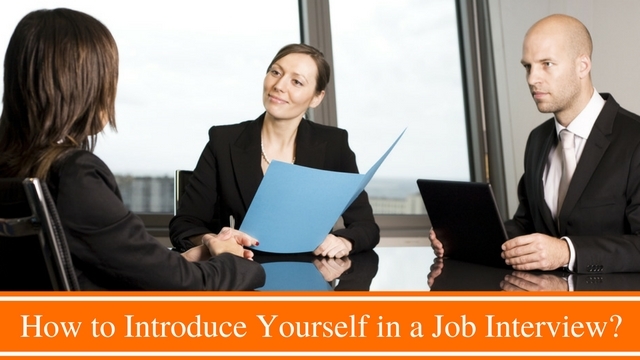 Now to conclude the above mentioned are few best tips on introducing yourself in an interview that you need to follow. So study well, and best of luck for your interview!